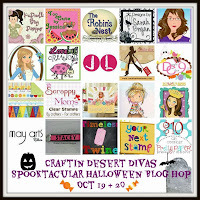 Hello everyone and welcome to Nonna's Craft Corner AND day 2 of the Craftin Desert Divas Spooktacular Halloween Blog Hop! We are so happy that you could join us today! If this is the first time that you have hopped with us you won't be disappointed. My friends are all amazingly talented.Please be sure to start at the beginning at Craftin Desert Divas so you don't miss out on a thing! You will not only get some inspiration, but you could win GREAT prizes, too!! You must FOLLOW and COMMENT at all of the stops both days to have a chance to win. For this two day hop each blog on both days will be offering a prize from a sponsor. You must visit each stop both days to be eligible to win. Winners will be announced Oct 22. 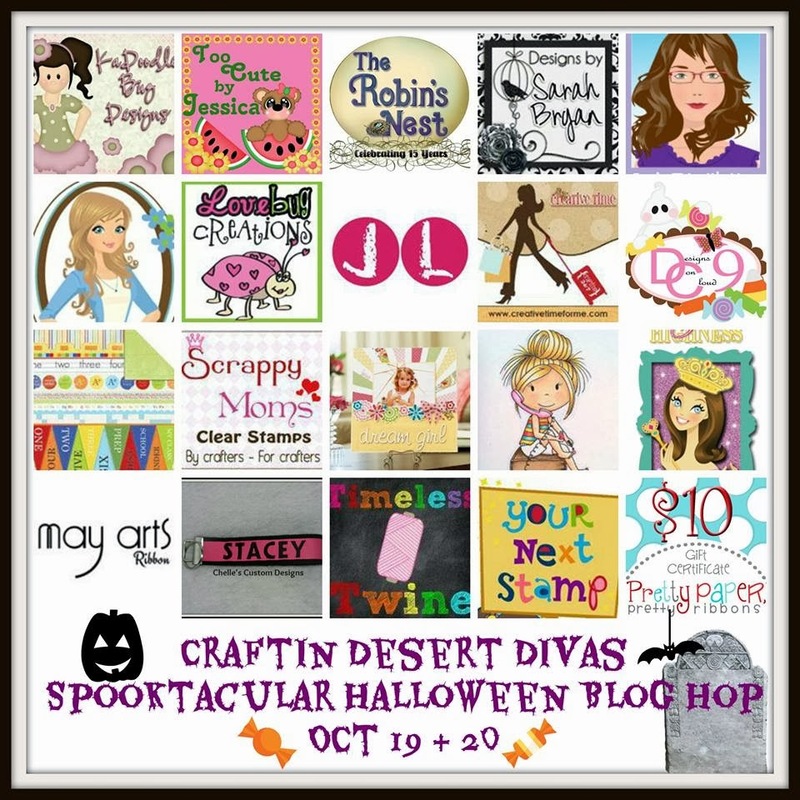 The complete list of winners will be on Craftin Desert Divas blog. I added a piece of tulle to the top of my canvas so that I can hang it on my granddaughter's bedroom door, but I think it's also pretty cute on the easel. Okay, that's my project for today's hop. I hope you have enjoyed your visit with me and hope you will stop by again soon! Your next stop on today's hop is my sweet, talented friend Sherrie at Sherrie Scraps With Passion. Your canvas projects is so darn cute Tanya! I have to make something on canvas-so inspired! I am SURE it will look fabulous on your Granddaughter's door! You are such a FUN Grandma! Love it-so fun to be in the hop with you! OMG! I am sure your sweet little granddaughter will be ticked pink with your very creative wall art. Totally cute and fun! I love the witch! So cute! This is just fantastic. What a wonderful idea. I love it. Tanya I looooove it!!! I just love it!!! Perfect amount of pretty for Halloween!! I was just trying to figure out how I could make some witch legs for my porch and then I thought..... 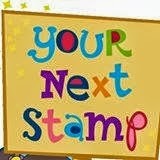 I gotta get a pair of these on a card!! This is terrific!! Have a fabulous day my friend!!! Way fun. I need to get a skirt like this (socks too). I think my students would love it! Glad to be in this hop with you! This is adorable, Tanya. You will be her hero. Best grandma ever! 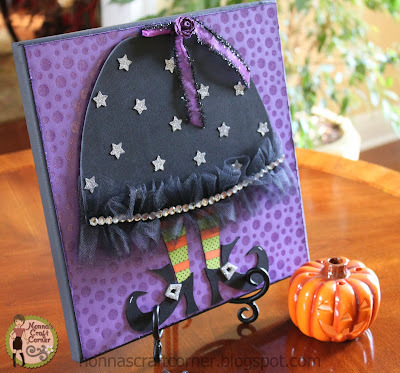 This is one adorable piece of decor for Halloween, Tanya! Love that purple/black combo and the tulle is such a cute addition! TFS...I'm tickled to be part of the hop with you this weekend! Love your fashionista witch! Even witches have to look good! I love it and I am sure that your granddaughter will too! Too cute! Very cute. I bet she'll love it. TFS. How awesome is this! OMG Tanya I LOVE this!!! The file you used, the embellishments you added....such an AWESOME project! Thanks for sharing my friend and have a GREAT Sunday!!! Love this card!! The papers and embellishments are just super. Thank you so much Tanya for being a part of my hop. Super cute...love the trim on her skirt!! Cute card I love the lace and bling. So adorable... My friend Patty would love this. This is just darling! 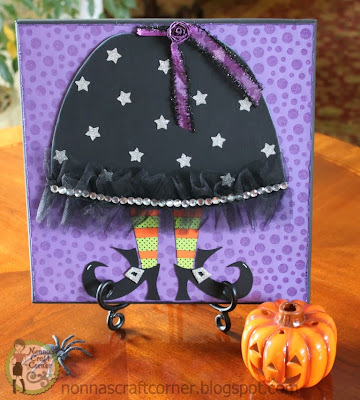 I love the ruffle trim on the witches skirt! I'm sure your granddaughter will love it! This is SO SUPER COOL Tanya! What a FUN decoration! Your grand daughter will LOVE it...especially since you made it just for her! AMAZING JOB! Fabulous card. Love your witch and her skirt. love your project!!! happy to be hopping with you! Wow This Canvas is great for Halloween! Detail is gorgeous and love the style of it. These is so fabulous!! I love it! cute cute cute. love the layering and 3d look. love the papers thanks for sharing. LOVE your canvas project! It is AMAZING! Thanks for sharing!!! Super cute - love the ruffle and bling on the skirt. Oh Tanya, this is absolutely adorable!! Love the design and I bet it will look great in your granddaughter's bedroom!! Thanks for the fun hop!! That is just too cute LOL. Love it!! Wow, it is soooo cute. Love the touch of tulle. Wow this is s clever. AWESOME Tanya. Your card is GREAT, i love this! Oh I want this! I wish you were giving it away as the prize! How cute & clever! Just adorable! Every time I see this, I fall in love all over again!! :) I absolutely adore this, and I want it!! I just love everything about it. I LOVE it! What a cute idea!! This is awesome! I love it. I love your idea of just using the bottom half of the witch. Now this is the cutest card. Love it. So whimsy and fun. Tanya ~ Oh now this is just WAY you CUTE!! I LOVE what you did with this cut! The little tool piece with pearls is so darn ADORABLE!!! EEK! You are so darn creative over here! So happy my internet is back up because I would have missed even more!